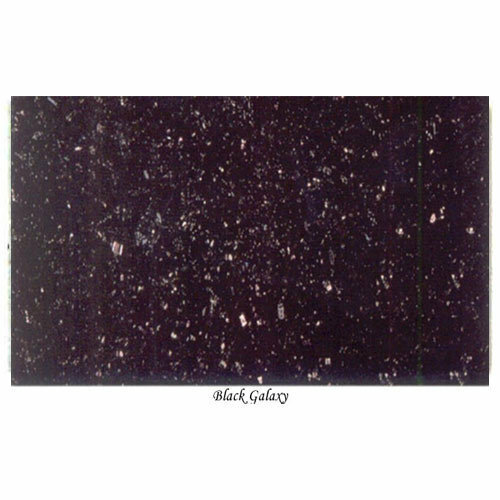 We hold expertise in processing a ravishing assortment of Black Galaxy Granite. Our range of Black Galaxy Granite, Galaxy Granite Stone and Black Granite Stone is ideal for different kinds of flooring and tiling purposes. These high quality granites are durable, and have an extremely smooth surface finish. Our company Bhagwat Marble established in 1986, is a renowned marble exporter and importer known for their world class and variant quality of marbles. Since the day of existence we have been catering the needs of stone industry by providing high quality marbles as per the demand. We suuply almost all types of marbles, in almost all colors and patterns ranging from green marble, sand stone, C pink, white/red slates (all other colors), white marble, Indo-marble, Italian marble & all granites. As a result of more than two decades hardwork our business has expanded to outside countries from Mauritius, Taiwan, Gulf, Australia to USA. Product Range : We provide our customers pure and excellent quality marbles and granites. The range includes: Green Marble Sand stone C pink White/Red Slates (all other colors) White marble Indo-marble Italian marble All Granites Specialty Our range of marbles and granites are the most preferred one in the market. Huge variety of colors with sharp finishing and cuts make us distinct from others. The marbles and granites supplied by us are of supreme quality and tangible evidences of our credibility and vast resource structure. We deal only in those products that are literally manufactured with the help of state-of-the-art manufacturing facilities, latest technologies and also that are excellent in quality and have emerged from virgin quarries & crack free Zones. This is the case with all our products - Green Marble, Sand stone, C pink, white/red Slates (all colors), White marble, Indo-marble, Italian marble & All Granites.